(AllHipHop News) Snoop Dogg, Cold War Kids, Adam Corolla, Capital Cities, Emmanuel Kelly, members of the Wu-Tang Clan and more are set to perform at the inaugural Salute The Troops Music And Comedy Festival in Pomona, California. The unique offering was created to honor America's troops and veterans. “I’m looking forward to the performance and putting on a great show for the troops. Thank you for all you do for our country,” Snoop Dogg said in a statement. 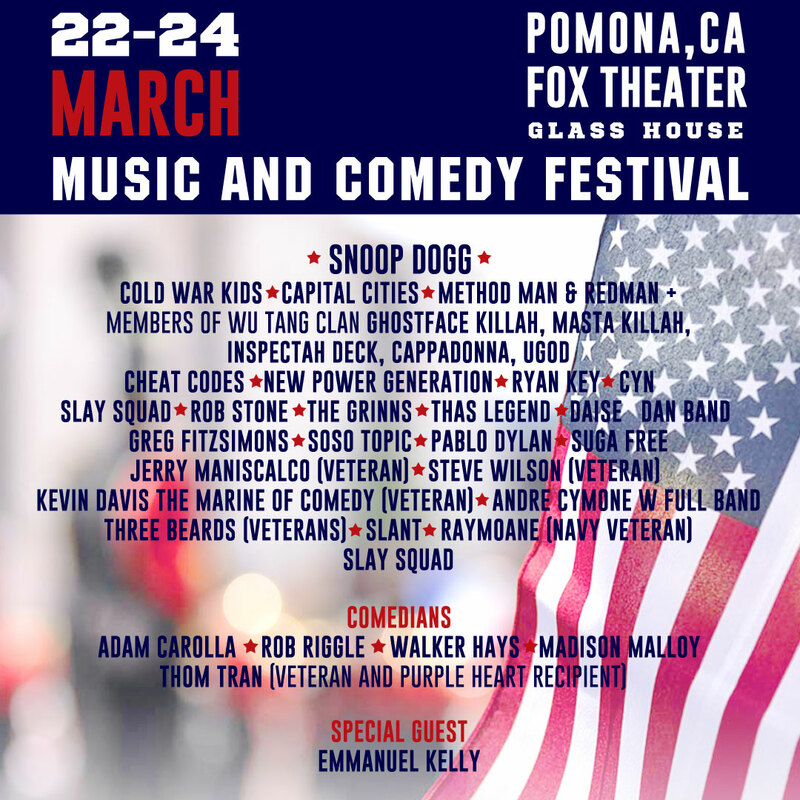 The first ever Salute The Troops Music And Comedy Festival well take over the Fox Theater and Glass House in Pomona, CA on Friday, March 22nd, Saturday, March 23rd, and Sunday, March 24th in a celebration that encompasses Hip-Hop, rock, comedy and more. The weekend line-up includes Snoop Dogg, Cold War Kids, Dashboard Confessional, Capital Cities, Method Man, Inspectah Deck, Ghostface Killah, Masta Killa, Cappadonna, U-God, Redman, Cheat Codes, Yellowcard’s William Ryan Key and other musical acts. Comedians like Adam Carolla and Rob Riggle will give fans and supporters of the troops the opportunity to laugh heavily. The undertones of the festival are not so funny. Organizers want to highlight Post-Traumatic Stress (PTSD) and the "epidemic suicide rates" that ail soldiers and veterans that have experienced the harrowing rigors of combat. For each ticket sold, one goes to an active service men or women. Similarly, vets can purchase tickets at a discounted price. “We are truly humbled at the support we receive from our community. An event such as this, honoring the men and women of the armed forces, is greatly appreciated,” said Major Perry Covington, USAF. Nate Parienti, the co-founder of Salute The Troops, echoed the sentiment. Salute The Troops Music And Comedy Festival was founded by Nate Parienti and co-founded with John Wertz (USMC 2001-2006) of Semper Fi Productions. Salute The Troops will take place at March Air Reserve Base on an annual basis with select artists interacting with troops and participating in military activities. Attendees can view and take photos with over 80 aircraft on display at the festival grounds. Other highlights include a special guest performance from X Factor contestant and Coldplay collaborator Emmanuel Kelly who is s survivor or The Iraqi War, as well as DJs, craft beverages and meals and more. The WU Be Comin' Thru.... Wu-Tang Forever! Wish I Was on the WEESSSSSIDE!